It is well established that ‘play time’ provides children and young people with an opportunity to enhance mental and physical health, socialise with others, increase self-esteem, build independence and stimulate imagination. A number of organisations and websites promote local playgounds, highlight playground features and identify whether they have inclusive elements. Inclusive Playspace’s objective is to promote and support the increase of play opportunities for people of all abilities and be a catalyst for change. Inclusive Playspace is guided by a national group of play academics, practitioners, associations, corporations, government departments and advocates and aims to influence the creation of more inclusive playgrounds in Australia, helping to ensure that all children have the right to play in their communities. 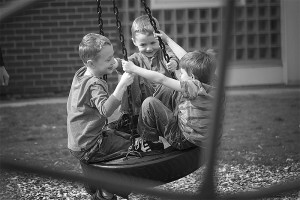 This website provides information about playgrounds across Australia, drawn from recommendations made by parents who use these playgrounds. Hundreds of Australian playgrounds are listed according to type and location, with the Inclusive Playgrounds list being a particular favourite amongst users. The Liberty Swing is a revolutionary design in play equipment which offers people in wheelchairs the opportunity to experience the joy of having a ‘swing in the park’. The Liberty Swing allows for the whole family to go to the park together and have inclusive fun at the playground. The Liberty Swing is safe, easy to use and is an enclosed apparatus that enables a wheelchair to swing from its frame. The Liberty Swing is also fitted with a ‘pop up’ chair to cater for those with limited mobility. To ensure a safe, fun and enjoyable experience the Liberty Swing includes: ramp access; wheel locking mechanism; safety harness; pop up seat; clear instructions on how to use the chair; and, an easy to use key providing access to the swing. A Master Locksmiths Association (MLA) key is needed to access the Liberty Swing. Generally, councils and park managers distribute or sell these keys. The key can then be used to access a Liberty Swing anywhere in Australia. For more information about Liberty Swings and to find a swing near you visit www.libertyswing.com.au or contact your local council.